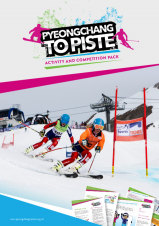 PyeongChang to Piste is a campaign that aims to raise awareness of snowsports and to help provide a chance for everyone to get involved in the sport. This cross-curricular resource is designed to be used by teachers of young people aged 7–14. Activities involving discussion, research, a quiz and a design-based competition introduce young people to the exhilarating and rewarding world of snowsports, via the Winter Olympic and Paralympic Games 2018. You can download our resources below; if you are a teacher, the Activity and Competition Pack has teacher notes to support the learning. 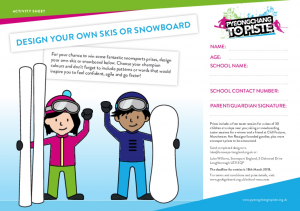 The PyeongChang to Piste Design Competition document is suitable for any participation wishing to get involved with our national competition with a chance to win some great snowsport prizes including a free taster session for a class of 30 children at a slope near you, a free taster session for skiing or snowboarding (worth £60.00) for a winner and a friend at the Chill Factore, 5 Rossignol branded goodies and other snowsport gifts to be announced! Competition is open to participants at primary school age and older. Entrants limited to England, Scotland and Wales only. Any entrants under the age of 18 must have their entry signed by responsible parent / guardian over the age of 18 years old. Entry for the competition closes on the 18th March. Any entrants received after the 18th March will not be judged or counted. Winners will be contacted once all entries have been judged. To enter, you simply need to complete the design sheet and fill in all the details before sending it to either luke@snowsportengland.org.uk or posting to Luke Williams, Snowsport England, 3 Oakwood Drive, Loughborough, LE11 3QF. Only one entry per person is valid. 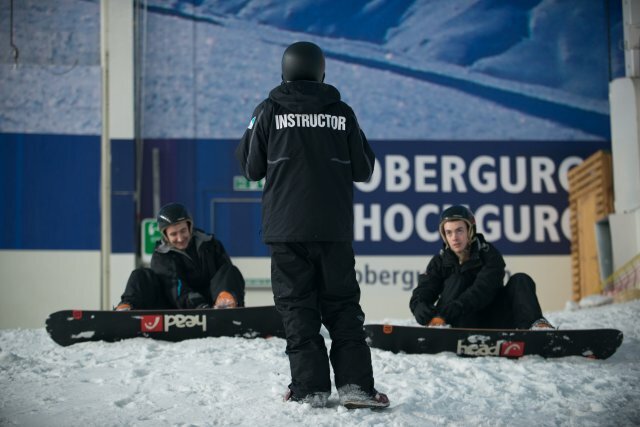 If you win the top prize of a free taster session for 30 members of your class, the competition will cover the cost of the sessions but the winner must cover the cost of other expenses including travel- unless stated otherwise by a member of Snowsport England. Snowsport England will not share any personal details received with any external partners and will only use that information to be able to contact the winning entry/entries.